We made this Chicken Suya Skewers today, yesterday and the day before, just because it was good and healthy-I used Chicken breast and you know Chicken breast is good for you; it's healthy. I was never a fan of Chicken breast but since I started making it like this, suddenly I'm in love! I'll show you just how to make it, you will be surprised how easy it is! I have a video that shows exactly how I did it HERE, make sure you SUBSCRIBE to my YouTube Channel by clicking HERE , it let's me know that you like my uploads and that I should do more! Soak bamboo sticks in water. Preheat oven to 350 degrees (the top grill). Threads chicken into the bamboo sticks, just like you see how the mallams do Suya. In a bowl, add suya spice, salt, onion powder and vegetable oil, mix together, set about 2 tablespoons aside for brushing your chicken when it is done. Do not use the left over marinade or cutlery or plate (unwashed) that you used for the chicken, it's contaminated and that's how you get food poisoning. Using a brush, or just your spoon, apply the marinade over the chicken, on each side and place in fridge for 30 minutes, although you can cook it immediately. Rub a bit of oil on a grill pan and heat it up for about 40 seconds. Bring out chicken from fridge and place the skewers on the grill pan, 2 minutes on each side. Transfer the chicken skewers to the over and allow to grill for 4 minutes and brush with left over marinade. Total cooking time should be about 10 minutes if not your chicken breast will not be tender, it will be stiff and not so nice. Sprinkle more suya spice on it, and chop some onions. 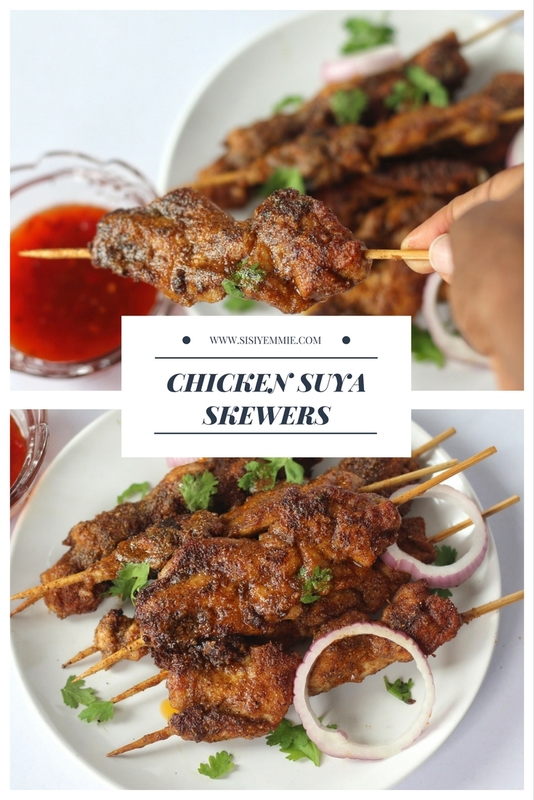 Enjoy your suya chicken skewers! SEE VIDEO BELOW, DON'T FORGET TO SUBSCRIBE! Mmmm, yummy! But there's no link on the "how to slice the chicken" bullet point. I will try this during my spare time and I hope I wouldn't burn down the kitchen while doing it. Looks delicious, what brand of suya spice do you use?